The book is set in 1635 and this period was the peak of the persecution of witches and sorcerers in Europe, when intolerance of minorities of all kinds was extreme and authorities used the full might of Canon and civil law to enforce it. There is a prohibition on all forms of witchery and necromancy, not to mention traditional Catholic rituals, and as in Britain with the persecution of the witches, mere accusation is usually enough. It’s impossible to prove innocence and of course this barbarity lends itself to cynical exploitation by anyone with a grudge, a secret to hide, or a political agenda to enforce. Also swept up in this repression by those too ignorant to understand or too conservative to have an open mind, is anyone perpetuating new discoveries in science. The penalty was usually death of one gruesome kind or another, sanctioned by Exodus 22:18 which commands that ‘Thou shalt not suffer a witch to live’. So Jónas is actually ‘lucky’ to have escaped that fate: he is accused of heresy but instead he is exiled to a bleak and barren island where no one may help him on pain of death. Here he reflects on the events that have shaped his life. His loneliness is not much assuaged by the arrival of his wife, Sigrídur. She doesn’t have much patience with the ‘nonsense that landed [them there] in the first place‘ (p76) and he thinks her loyalty is misplaced because has ‘done her nothing but harm’ (p76). While never repentant about his ‘intellectual‘ pursuits, he does feel guilty about making her life on the mainland untenable. As well he might, I think she’s smarter than he is if his naïve little anecdote about how they first met is anything to go by: he first hears of her because she is ‘moonstruck’ – but what she is actually doing, ‘her lunacy [having] rendered her calm and sensible’ is measuring the phases of the moon, having somehow learned arithmetic from a source she won’t reveal. His curiosity aroused, Jónas sets out to see her, arriving on the occasion of a solar eclipse. She leads him away from the infectious pandemonium and demonstrates with a planetary model made of pebbles the then revolutionary idea that an eclipse can be predicted. Interestingly, Jónas admires Sigrídur’s model of ‘the heavenly bodies around the earth in their familiar orbits’ (p86, underlining mine). I am not certain whether this is an unintended anachronism by Sjón (which seems unlikely); whether it’s meant to show that Iceland was more backward than the rest of Europe at that time; or whether it’s meant to be an indication that these two didn’t have access to the latest discoveries in science (Sigrídur, by definition because she was female and Jónas because he was a self-taught ‘natural’.) Although suppression of scientific knowledge due to rigid insistence on the Bible’s teachings was widespread, Copernicus had published On the Revolutions of the Celestial Spheres back in 1543 but more widely known throughout Europe by the time of this story was Kepler’s Epitome of Copernican Astronomy which had been published between 1617-1621, i.e. in the lifetime of these characters. (Kepler’s’ book explained his planetary laws which were in turn based on Copernicus’s heliocentric system). Neither Jónas nor Sigrídur know of it. Or were they both just being wary of revealing what was a heresy when they barely knew each other? Giordano Bruno had been burned at the stake in Rome for suggesting that the earth revolved around the sun in 1610, though that was a lifetime before 1635. But there is also wisdom within the pages of this witty, discursive little book. Sjón shows that polemics is nothing new: villagers discount their own experience of the Basque whalers as honest and generous and slip readily into prejudice and hatred. Jónas deplores man’s inventive use of simple domestic tools as weapons, and he notes that renaming places (as the Soviets routinely did) never absolves them from their past. ‘It does not help, the visions will not go away’. (p209). The patronage of the Danes is of no more use to Jónas at risk from extremists than diplomatic pleas to Islamic kidnappers have ever been, There are lots of clever parables like this. I do hope it makes the shortlist for the IFFP. 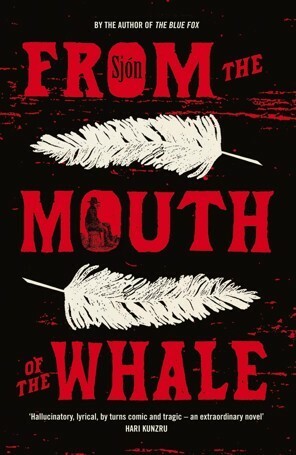 A.S. Byatt at The Guardian found both the book and its talented translator ‘extraordinary‘ but it’s Tom at A Common Reader who should have the last word: from the Mouth of the Whale is ‘entertainment – a quirky story of times past in a strange culture. It works on the level of “story-telling” and it would be a great book to read aloud’. Just in case you were wondering, as I was, about an author (like Stendahl) with only one name, Sjón is the pen-name of Sigurjón Birgir Sigurðsson and is formed from his given name which means ‘sight’. See Wikipedia. Update 19/1/17 Becky reviewed this book too, at Becky’s Books and also The Blue Fox by the same author. Oops, thanks for reminding me to add the Shadow reviews! There’s so much in this book, isn’t there! It’s one of those little books that take longer to read than you expect because there are so many fascinating threads. I loved this book. My favourite so far. And interesting how each of us has taken something different from it. PS Love the gravatar, Mark, very erudite! This IFFP prize has been great for introducing me to literature from countries I’d never read before.